Born in Enoree, South Carolina on September 13, 1912, Claude Casey came from a long line of Carolina musicians. His grandfather, father, and mother played fiddle and his aunt played banjo. “This is how my mother and father first met, playing for a dance,” remembered Claude. 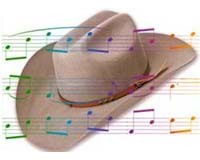 “So I was around music back in my younger days; that’s what gave me the bug.” His first instrument was the harmonica and before long he learned to accompany his father at square dances. When the family moved to nearby Whitmire, Claude met Lawrence and Carl Boling who introduced him to guitar playing. In his early teens, Claude moved with his family to the Shenandoah Valley of Virginia and then into Danville. He was impressed by the music around his home. The Danville area in the late 1920s teemed with influential stringband musicians including banjo player Charlie Poole, fiddler Charlie Laprade, and guitarist Elton Biggers. While in Danville, Claude began playing guitar with local stringbands the Piedmont Serenaders and the Schoolfield Woodchoppers and gradually took up singing. In 1929, at the age of sixteen, he made his first appearance on radio over WBTM in Danville. He landed a fifteen minute program on Saturday mornings billed as the Carolina Hobo and soon began broad­casting on WBTM with friends Jake King, Tex Isley and Marvin Fowler as the Pine State Playboys. Casey was just eighteen and had worked intermittently as a mill hand, apple picker, and plumber’s apprentice, but his heart was set on music. The early thirties were lean times for most Carolina musicians and for Casey as well. The Pine State Playboys broke up and reformed a number of times during the thirties with shifting personnel who included, in addition to Casey, Jake King, Johnny Stafford, Willie Coates, Lawrence and Carl Boling, Jimmy Rouse and Roger Morris. Casey earned his stage name “Carolina Hobo,” hitchhiking and playing music as far away as Texas and New York. But when jobs ran out he returned to the Danville area where his family still lived. Casey set out again with thumb and guitar for New York in 1936. He won an appearance on Major Bowes’ Amateur Hour in New York and toured with the Bowes organization throughout the Southeast. When he returned to Danville from his successful debut with Major Bowes, even the mayor came over to greet the hometown boy. By the late thirties, Casey had realized a major ambition—to make records. He first recorded in New York for Art Satherly of the American Record Corporation in 1937, showing his local roots with such numbers as Memories of Charlie Poole and Moonshine in the North Carolina Hills. Back in North Carolina, the 1938 ensemble of Claude Casey and his Pine State Playboys recorded for RCA Victor in Charlotte and Rock Hill. 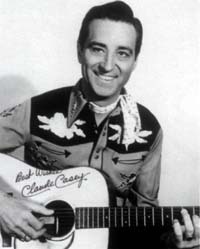 Casey’s polished vocals and fine yodeling foreshadowed the talent and popular appeal which would mark his radio, songwriting, film, and television careers. Casey’s travelling days were by no means at an end. The next few years saw him in Kinston with the Pine State Playboys, in the Midwest with Fat Sanders’ Country Cousins and in Florida with the Rouse brothers. By 1940, Casey had reformed the Pine State Playboys, this time with Kelland Clark, Clinton Collins, and Jimmy Colvard, to record for RCA Victor in Atlanta. In 1941, Casey walked into Charles Crutchfield’s office at WBT one day and asked him for a job. Crutchfield auditioned him, hired him, and put him on the air that day. 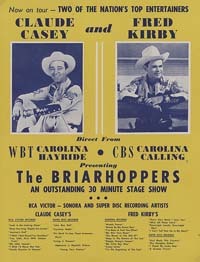 Casey became a featured singer on the Dixie Farm Club and the Briarhopper show. “Everybody that worked at WBT was a Briarhopper,” recalls Casey, who soon joined the Briarhoppers and the Tennessee Ramblers in their schedule of personal appearances throughout the piedmont. He made his first movie with the Tennessee Ramblers, Swing Your Partner, in 1943 and went on to make ten more films in the coming years. Casey remained with WBT for twelve years appearing on local and CBS network shows including the Carolina Hayride, Carolina Calling, and the Dixie Jamboree for which he was host and scriptwriter. His association with WBT became more than just another radio job. “Working at WBT was one of the greatest things that ever happened to me. I made a world of friends and found a beautiful woman that I married.” Claude and Ruth Casey married in 1942 and settled down in Charlotte. After World War II, Casey’s increasing success with Western music, led him to form his own band at WBT, Claude Casey and his Sage Dusters. Still closely tied to the WBT family of performers, Casey toured at the same time with Sam Poplin, Homer Christopher and Shannon Grayson as Briarhopper Unit Number Two. After the breakup of the Briarhopper show in the early 1950s, Casey took his Sage Dusters to WGAC in Augusta, Georgia and then to WFBC-TV in Greenville, South Carolina. In the early 1960s, the Caseys settled in Ruth’s home town of Johnston, South Carolina where they founded radio station WJES, their son Michael eventually taking over as general manager. Claude Casey passed away June 24, 1999. In 2007 the British Archive of Country Music released a CD of his 1938 – 1953 recordings, Claude Casey, “The South’s Favourite Yodeler” (BACM CD D 197). An older re-issue appears to be out of print: Claude Casey and the Pine State Playboys (Old Homestead OHCS 182, 1987). His papers, including numerous recordings, sheet music, film scripts and concert posters, are at University of South Carolina.